As our nation grapples with the question of how we address crime in our communities, we look to the Church for a faithful response to violence and wrongdoing. 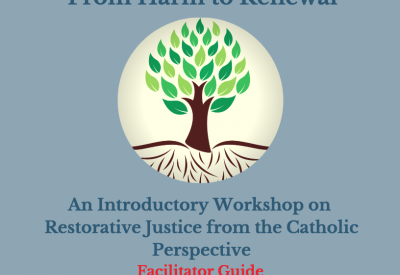 CMN’s Restorative Justice Workshop provides an overview of restorative justice philosophy and explores this issue through the lens of Catholic Social Teaching. A slide by slide Facilitator’s Guide and participant handout ensure you have everything you need to clearly present our stunning Prezi Presentation from opening prayer to closing discussion questions. Please register to receive a copy of the From Harm to Renewal Workshop: Restorative Justice Workshop . Your download will begin automatically after registration.